A coronial inquest into the suspected murder-suicide of a Sydney family has heard the husband and father believed responsible was having an affair with a teenager in the Philippines. Maria Lutz, Fernando Manrique and their children Elisa, 11, and Martin, 10, were found dead in their northern Sydney home on October 17, 2016. A family friend called police when Ms Lutz did not turn up for tuckshop duty at the children’s school. Counsel assisting Adam Casselden said the evidence suggested all four had died from carbon monoxide poisoning “after [Manrique] introduced carbon monoxide into the family home as the family slept”. “The evidence will show little cause for doubt that Manrique was responsible for sourcing carbon monoxide and introduced a piping system into the family home,” Mr Casselden told the coroner. He said the inquest would also look into potential regulatory changes on the supply and delivery of carbon monoxide. Mr Casselden said the couple were experiencing marital difficulties in the three years before the incident. But, he said, Ms Lutz was a “dedicated and loving mother” to their children, both of whom had autism. 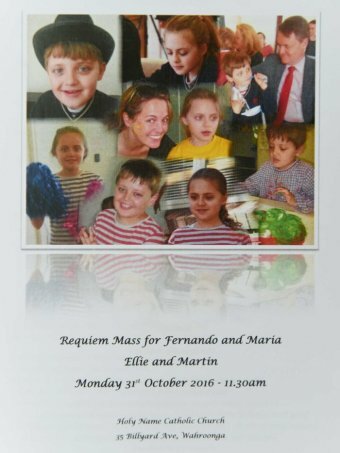 “Caring for Martin and Elisa was no doubt challenging,” Mr Casselden said. Mr Casselden said the couple had a debt to the Australian Tax Office of about $15,000 in September 2016. Ms Lutz had been a criminal lawyer in their native Columbia, but was a full-time carer for her two children at the time of her death. “Manrique told [his business partner] Mr McKenzie that he was struggling to hold everything together and said ‘I just need to slow down’,” Mr Casselden said. The coroner heard that Manrique was also financially supporting a woman he was in a serious relationship with in the Phillipines, where he spent two weeks every month for work. “Manrique confided in his friend his marriage had become strained, he was seeing other women and there was nothing left in the relationship,” Mr Casselden said. Mr Casselden told the coroner Manrique set up an account with a gas supplier in his business’ name in the month before their deaths, and ordered two cylinders of carbon monoxide which were delivered to a friend’s house. He said Mr Manrique had also visited Bunnings four times in the week before the deaths to buy hosing. Mr Casselden told the court this death could have broader implications for regulation of the gas industry, and that the supplying gas company — BOC — had made changes after learning of the deaths, including making the availability of pure carbon monoxide on their website less visible.